At a well-attended meeting (70-80) at Finnstown House Hotel this evening South Dublin Planning Departments set out its stall for how and why it feels the Adamstown plan needs to be reviewed 10 years since the plan was adopted. This followed a successful lengthy appeal at An Bord Pleanála by local residents to ensure infrastructure was stitched into the plan . (You can read some history of the original Adamstown plan and my involvement at the bottom of this post). In fairness to the planning department they had put some thought into how they structured the consultation meeting this evening. Those attending were divided into tables of about 10 with a planning official at each table. Those at each table were given approximately 10 -15 minutes to discuss various topics of how it felt to live in Adamstown, its shortfalls, and possible changes the council (or in my view the developer) believes need to be reviewed. The structure did ensure that everyone did get an opportunity to express their views. At the table where I sat the overwhelming feeling was that Adamstown was not the scheme they bought into. The planners made it clear that the development had delivered everything up to the time of the property crash under planning terms, and that some of residents concerns were created around marketing pledges made by the developer which were not delivered. Most people agreed there was a sense of community, it is architectural an attractive scheme, it feels European and the schools were good. The lack of frequency of public transport was a raised and the lack of a public park. As the evening went on it emerged from the planner’s comments that they are strongly leaning away from the original plan and moving towards reducing the density of the overall plan. The was even a mention in returning to the traditional 3 bedroom homes that blighted Lucan through the 90’s. So you might say what’s wrong with that? people will have their own gardens. There were a few good reasons why the planners when deciding on a scheme for Adamstown decided on increasing the density. Dublin throughout the 70’s through to 90’s had sprawled with schemes of 3 bedroom semi-detached estates one after another with no sense of community. Dublin could not continue to develop is this uncontrolled manner. This type of development had seen schemes stretched out to all areas of Dublin, into Wicklow, Meath and Kildare which were mostly unserviceable by public transport, with no alternative but to use a car as the primary means of transport. This in turn leads to gridlock before you even got out of your own area. These 3 bed semi-detached estates chewed up huge chunks of land driving up the price of land. This pushed more people from the city working in the city to live further away some spending more than 4 hours each day just commuting. Dublin with a population of 1.2 million has the same footprint as Los Angeles which has a population of almost 4 million. While the housing market has stalled right now even the most pessimistic economists will tell you that the market will return slowly. The projected population of Dublin in 2050 is 2.5 million. To alter the plan now is a panic move to change strategy without considering the long term outlook for Dublin’s development. One of the biggest selling points of Adamstown and further schemes in Dublin was if public transport was ever going to be viable building denser populated areas close to public transport links was essential. In Adamstown case this was the Kildare commuter’s line, if people care to read the plan its states that the long term objective includes electrification of the Kildare line which could offer the same frequency as the Dart service. This will never be achieved with low density 3 bedroom homes, not even bus services are viable in this type development. Fuel prices will continue to rise as oil reserves diminish we need to plan for better public transport for Dublin, keeping people closer to their place of work. Of late there has been a growing trend in the media to convince people they don’t want apartment living and what they really want is a 3 bedroom semi with front and back garden and the picket fence. These are the very same people who told us we needed to get on the property ladder in the Noughties. The problem with most of the apartment complexes built in the past was they were too small lacked enough daylight and facilities. Adamstown does not fall into that category apartments are well laid out and look attractive. And had the development not stalled I believe most people would be very happy with life there. People who purchased in Adamstown bought into a particular vision, with schools, shops, parks and public transport all close by, not a Hodge-podge development of apartments with rows of semi-detached dwellings slotted in. It came across that people liked the “European” feel Adamstown has. In an article in the Lucan Gazette (9th February 2012) Dr Paula Russell of The UCD School of Geography, Planning an the Environment, had this to say on planning for the future: “We have to look forward even now to 20, 30 years into the future. Dublin city has becoming sprawling, and we need to provide those kind of densities around transport hubs”. If South Dublin County Councillors vote through an amended plan that will reduce the density by 20% it will be yet again at the expense of the residents who bought into Adamstown. The housing market is flat in Dublin and will remain so for some years, changing the plan to 3 bedroom homes is a red herring it will not have any real bearing on the market. Really this is a veiled attempt by the developers rid its self of the generous infrastructure which is linked into the Adamstown development. Leaving the way clear when the property market does pick for the developer to return to the old ways of building houses not communities. Is that what we want? The bottom line here is less density = less infrastructure, this is going to be a long campaign and neither the interest of the residents of Adamstown current or future and the overall planning of Dublin is at the heart of this consultation. It’s about given back power back to the developer to decide how it can make money. 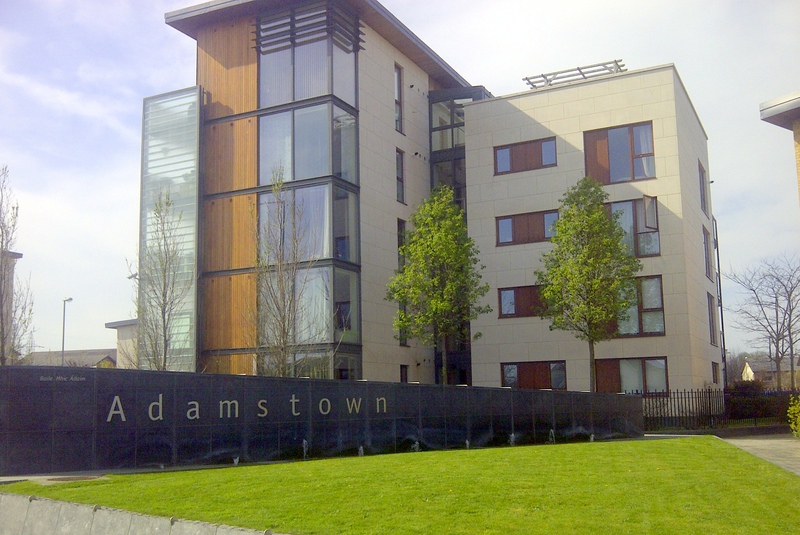 It took a very long time to secure infrastructure tied into development for Adamstown. I hope we have learned from the sins of our past, this will neither benefit the community or long term future of planning for Dublin. A further consultation meeting will take place on Monday 15th April, 7:30pm to 9:30pm. All comments are welcome on this post whether you agree or disagree with my views. I bought a Dublin apartment that got constructed in the 19th century. High ceiling, thick walls, good location, with lots of natural light. Only the best and most talented people were involved building it. These days every fool is a town planner/architect/builder. They have the communication skills and qualifications but lack natural ability for their professions. That’s why I avoided buying these overpriced recent apartments with their stupid balconies. I’ve even seen a new block in Dublin overlooking a traveller’s halting site! Like most thing in this country once the Prods left our planning/architecture went downhill. Great blog… Best of luck with your campaign.